I've been reading a lot of history over the holidays. Truth is, I find history more useful than all the speculation that inevitably heralds the start of a new year. I've especially enjoyed Lars Brownworth's Lost to the West - The Forgotten Byzantium Empire That Rescued Western Civilization. You can listen to a free podcast series by the author here. The focus in the book is mainly on the rulers - good, bad and terrible. 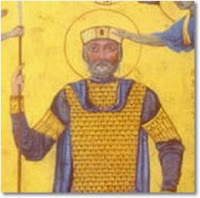 Of them all I rather liked Basil II - image opposite. Most importantly, students of history need to be constantly reminded of the transience of power, for transience is one of the fundamental characteristics both of the human condition and of the political order. Sooner or later, all things come to an end. Sooner or later, the centre cannot hold. All states and nations, however great, bloom for a season and are replaced. Materialism and consumerism are rife. Young people have to learn in a cocoon filled with false optimism. Unlike their parents and grandparents, they grow up with very little sense of the pitiless passage of time. Successful statehood, in fact, is a rare blessing. It requires health and vigour, good fortune, benevolent neighbours and a sense of purpose to aid growth and to reach maturity. All the best-known polities in history have passed through this test of infancy, and many have lived to a grand old age. Though who failed the test have perished without making their mark. In the chronicles of the body politic, as in the human condition in general, this has been the way of the world since time immemorial. For believers in progress it must be a dispiriting prospect. But if you can shake off this secular myth you will see there is no need to despair. The breakdown of a particular set of human arrangements is not after all the end of the world. Surely we would be better off if we put an end to our obsession with endings. Humans are sturdy creatures built to withstand regular disruption. Conflict never ceases, but neither does human resourcefulness, adaptability or courage. We tend to look forward to a future state of fulfilment in which all turmoil has ceased. ...But living in fear of the end is as stultifying as living in hope of it. Either way our lives are spent in the shadow of a future that's bound to be largely imaginary. Without the faith that the future can be better than the past, many people say they could not go on. But when we look to the future to give meaning to our lives, we lose the meaning we can make for ourselves here and now. The task that faces us is no different from the one that has always faced human beings - renewing our lives in the face of recurring evils. Happily, the end never comes. Looking to an end-time is a way of failing to cherish the present - the only time that is truly our own. So forget the future. Nothing lasts forever: although incredibly the Byzantine Empire lasted 1,058 years until its fall on May 29th, 1453. History can help us be a little more sanguine about the times we live in, and the challenges we face. Others have faced considerably greater challenges in the past, with far fewer resources and poorer prospects for success. Welcome back, Gerard, and happy new year! Cheers Hugh - many happy returns!